I stayed here for one night in July 2018. 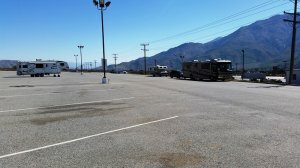 There is a large parking area just for RV's behind the parking area for trucks. The RV parking lot is paved and clean but not really level (which is not a problem). I had a quiet night with just a couple of other RV's on the parking area. I called ahead and asked whether I can stay there (and got a "Yes") but I think this is not really necessary. I did not visit the casino. This is a great place for overnight parking!